Colon (6-10) gave up four runs in seven innings. The portly and popular right-hander struck out one and walked none. Adrian Beltre, Jurickson Profar and Rougned Odor homered off Hernandez (8-10), who allowed a career-high 11 runs — seven earned — in six innings. ANAHEIM, Calif. (AP) — Shohei Ohtani hit a three-run homer during a seven-run first inning, and the Angels celebrated Mike Trout’s 27th birthday with a victory over the Tigers. Trout missed his sixth consecutive game with a sore right wrist, but his teammates maintained a celebratory mood at the Big A with 13 hits in their second straight win over the Tigers. Ohtani’s 411-foot homer was his third in August, and he added a single for his third multihit performance in five games. Andrew Heaney (7-7) lasted five innings for the win. Jeimer Candelario hit a two-run homer and drove in three runs, but Detroit dropped to 0-5 on its six-game California road trip. Jacob Turner (0-1) got the loss. DENVER (AP) — Jameson Taillon beat Chad Bettis in a matchup of pitchers who battled testicular cancer last year, and the Pirates hit three homers. Taillon (9-8) allowed 10 hits in his second complete game of the season. The 26-year-old right-hander struck out three and walked one, helping Pittsburgh stop a three-game slide. 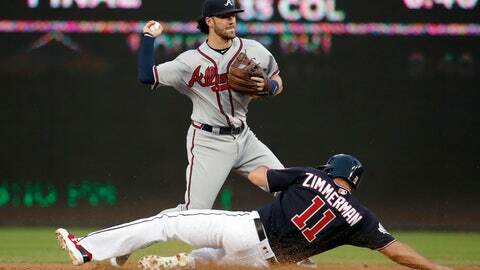 WASHINGTON (AP) — Ender Inciarte snapped a ninth-inning tie with a two-run triple, helping Atlanta to a doubleheader split. In the opener, Bryce Harper and Ryan Zimmerman hit consecutive homers to spark a four-run fourth inning that carried Washington to the victory. Seeking to blunt the momentum of the surging Nationals, Atlanta shook off a strong pitching performance by Max Scherzer before striking against the Washington bullpen in the second game. Freddie Freeman and Nick Markakis singled off Kelvin Herrera (1-2) before Inciarte hit a liner down the first-base line. In the first game, Zimmerman and Trea Turner had three hits apiece and Harper added two hits and two RBIs. Jefry Rodriguez (1-1) allowed one run in five innings in his first major victory. Kolby Allard (1-1) got the loss in relief of Max Fried, who was struck in the lower back by a line drive in the second inning and removed with a left groin strain. Allard allowed four runs in two innings. CHICAGO (AP) — Miguel Andujar hit a tiebreaking RBI single in the 13th inning, sending the Yankees in the victory. Andujar also led off the seventh with his 15th homer. Sonny Gray (9-8) pitched three scoreless innings to get the win in his first appearance since losing his spot in the starting rotation. New York slugger Giancarlo Stanton hit a tiebreaking two-run homer in the 10th, but Jose Abreu hit a two-run shot in the bottom half for Chicago. Adam Engel robbed the Yankees of a homer with an outstanding catch in center for the second straight night. Luis Avilan (2-1) got the loss. TORONTO (AP) — Mitch Moreland hit a three-run homer during Boston’s five-run 10th inning, and the Red Sox earned their fifth straight win. Moreland’s one-out shot off Ken Giles (0-3) followed a triple by Mookie Betts and a walk by Andrew Benintendi. Jackie Bradley Jr. added a two-run homer later in the inning. Boston closer Craig Kimbrel (3-1) gave up a solo homer to Justin Smoak with one out in the ninth inning, tying it at 5. It was Kimbrel’s second blown save in four outings. MIAMI (AP) — Matt Carpenter hit his 30th homer for St. Louis, a tiebreaking drive in the eighth inning. Paul DeJong hit a two-run homer in the seventh for the Cardinals, who have won eight of 12. Miles Mikolas (12-3) pitched seven innings, allowing two runs and five hits. Derek Dietrich had three hits for the Marlins, who have lost seven of eight. Elieser Hernandez (2-6) got the loss. CLEVELAND (AP) — Minnesota’s Fernando Rodney struck out Francisco Lindor with the tying run on second base in the ninth inning, helping the Twins to the win. Twins left-hander Adalberto Mejia (2-0) pitched five innings of one-hit ball before departing due to a strained left wrist. Indians right-hander Carlos Carrasco (13-6) allowed three runs and 10 hits in 6 1/3 innings. PHOENIX (AP) — Nick Pivetta threw six scoreless innings for Philadelphia, and Nick Williams homered. Zack Greinke (12-7) allowed only Williams’ solo homer on three hits in seven innings but lost his second straight. OAKLAND, Calif. (AP) — Rich Hill pitched into the sixth to beat his former club for the first time, and the Dodgers stopped the Athletics‘ six-game winning streak. Hill (5-4) allowed two runs over 5 1/3 innings. He is 3-1 with a 3.12 ERA in eight road starts. Khris Davis hit a two-run homer in the sixth for Oakland. Sean Manaea (10-8) was charged with three runs in 2 2/3 innings. KANSAS CITY, Mo. (AP) — Mike Montgomery pitched five-hit ball into the seventh inning and David Bote drove in a career-high three runs, leading the Cubs to the win. Montgomery (4-4) picked up his first win since June 29. He is 3-0 with a 0.40 ERA in four appearances against the Royals. Kansas City rookie Brad Keller (4-5) was removed after six innings, allowing four runs and seven hits. The Royals have lost six straight and are 14-43 since May 30. MILWAUKEE (AP) — Manuel Margot homered, tripled, singled and drove in five runs, powering San Diego to the victory. Franmil Reyes added three RBIs for the Padres. Matt Strahm (3-3) got one out for the win. All-Star Josh Hader (4-1) was charged with the loss after allowing two runs in 1 1/3 innings. SAN FRANCISCO (AP) — Tyler White hit a two-run homer in the eighth inning, helping Houston put together another late rally. The win followed the Astros‘ 3-1 victory Monday night in which Marwin Gonzalez hit a three-run homer with two outs in the ninth. The Astros have won six of seven and the Giants have lost four of five. Joe Smith (4-1) got the win, and Hector Rondon pitched a scoreless ninth for his 13th save. ST. PETERSBURG, Fla. (AP) — Willy Adames hit a solo homer with two out in the ninth inning, lifting Tampa Bay to the victory. Adames’ fifth home run of the season came off Miguel Castro (2-6). Sergio Romo (2-2) got the win after retiring two batters in the ninth, helping Tampa Bay break a three-game losing streak. NEW YORK (AP) — Cincinnati’s Sal Romano got the win in his New York homecoming, pitching into the seventh inning in a game delayed by rain for 1 hour, 40 minutes in the first. Romano (7-9) was born in Syosset on nearby Long Island and grew up in Southington, Connecticut. He allowed a run in six-plus innings, helping the Reds stop a three-game skid. Phillip Ervin hit a two-run homer for Cincinnati and finished with three RBIs. Mets starter Jason Vargas (2-8) recorded just one out and was charged with three runs and three hits.